iBUS 1 Data Cable can restore and upgrade software for iWatch S0 and S1 (38mm and 42mm). Currently, as of 28.03.2019, there are no up-to-date firmwares available for download in the MFC download area. For more information follow further updates. Support demo unit convert to normally unit. Work with Mac OS iTunes / Windows iTunes Version from 12.7. This iBUS cable does not have any software or iWatch firmware with it. You need to download and install the latest version of iTunes on your MAC PC. If you are using Windows PC then you need to use MFC Dongle, in order to use this cable. Unfortunately at this moment there is no way to restore OTA files (over-the-air) for the iWatch. Saying that, you should be 100% sure that you have compatible firmware to restore or update your iWatch, using iBUS cable. If you are unsure, please do not purchase this product. Cannot be downloaded from mfcbox.com, if you buy iBUS watch you need to find the original firmware by yourself. Note! If you are not MFC Dongle user or your MFC Dongle is not activated, firmwares from MFC page will not work for you. Can be downloaded from mfcbox.com. Use firmware required for MFC Dongle, which is not compatible with iTunes. Currently there is no up-to-date firmwares available for downloading. For more information follow further updates. In order to obtain access to firmwares, you need to submit the following information to techsupport@gsmserver.com: login for your account on mfcbox.com and order number. How to put iWatch in DFU and Recovery mode? How to put iWatch in DFU mode? Press and hold both Digital Crown and Side Button (Power Button), waiting screen will shutdown, then hold for 3 more seconds and release Side Button (Power Button). Keep holding Digital Crown for 10 more seconds. How to put iWatch in Recovery mode? Press and hold both the Digital Crown and the Side Button (Power Button), waiting screen will shutdown, then hold for 3 more seconds. Release Side Button (Power Button) and Digital Crown, then immediately hold Digital Crown and wait for 10 more seconds. 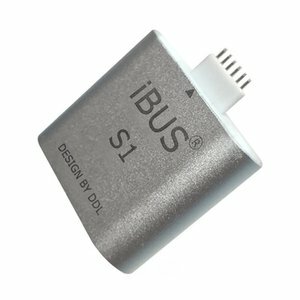 iBUS 1 Data Cable - 1 pc. Two in one adapter pilot pin - 1 pc.